Each Sunday, I think of something to make for my lunches during the week. I try to find a good mix of protein, carbs, and also something a little more fun than just a sandwich on gluten free bread (although those weeks certainly do happen!). This week, I made a sweet tofu stir fry with fall vegetables. It is delicious, and people are constantly asking me what smells so good in the microwave at school! If you don’t like tofu, this recipe could easily be used with chicken. Cut the tofu block into one half inch by one half inch cubes. Lay the cubes between two dish towels and let dry for a couple hours. In a large saute pan, add the butternut squash cubes and cooking spray. Over medium- high heat, let the butternut squash saute for 5 minutes. Stir every minute or so. 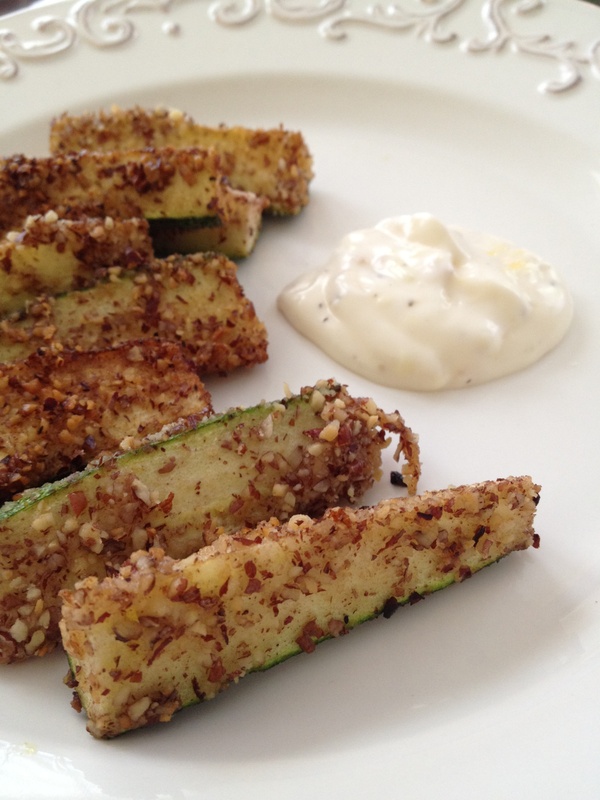 Add the zucchini and yellow squash rounds. Season with salt and pepper and stir the veggies every couple minutes. 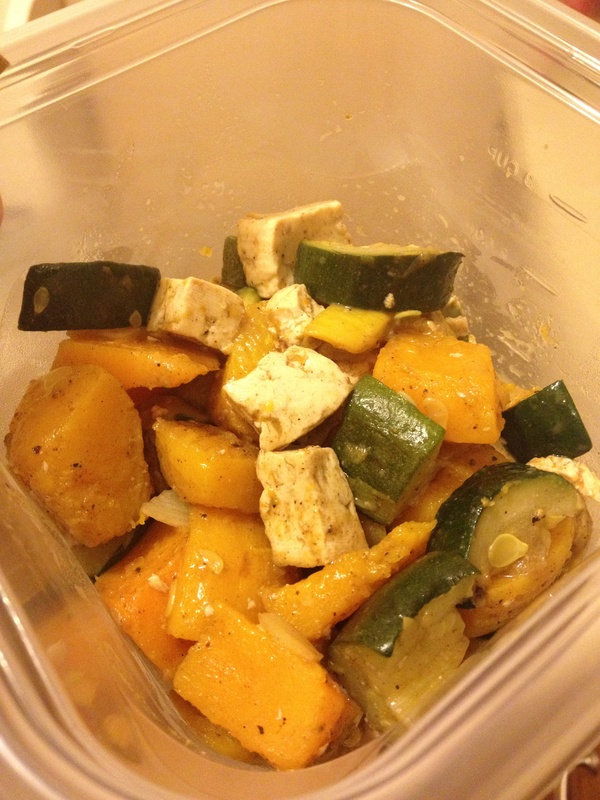 When the veggies start to soften, add the dried tofu cubes. Season with cinnamon, pumpkin pie spice, honey, and brown sugar. Continue stirring every couple minutes until the veggies are fork tender. Serve hot by itself or over rice, quinoa, or your favorite grain. Whenever I try to think of dishes to cook that can accommodate a gluten free lifestyle, I always laugh at the idea that American food is actually the worst for a gluten free diet. Traditionally, American fare can be processed and/or fried and thus has a lot of gluten. So, I often turn to ethnic flavors for a friendly meal. Here, I took some Thai flavors for a chicken dish over rice, and it turned out great! In a large saute pan over medium high heat, pour the olive oil and let the pan and oil get hot for about 2 minutes. Add the chicken, and season both sides of the chicken with the salt and pepper, red chili powder, and ground ginger. Let each side of the chicken sit in the pan and sear for about 3 minutes each side. Turn the heat down to medium. Add the zucchini, yellow squash, coconut milk, and basil leaves. Cover and let simmer until the chicken is just about cooked through, about 15 minutes. When the chicken is almost done, add the pineapple rings or chunks. Cook uncovered until the chicken is fully cooked. 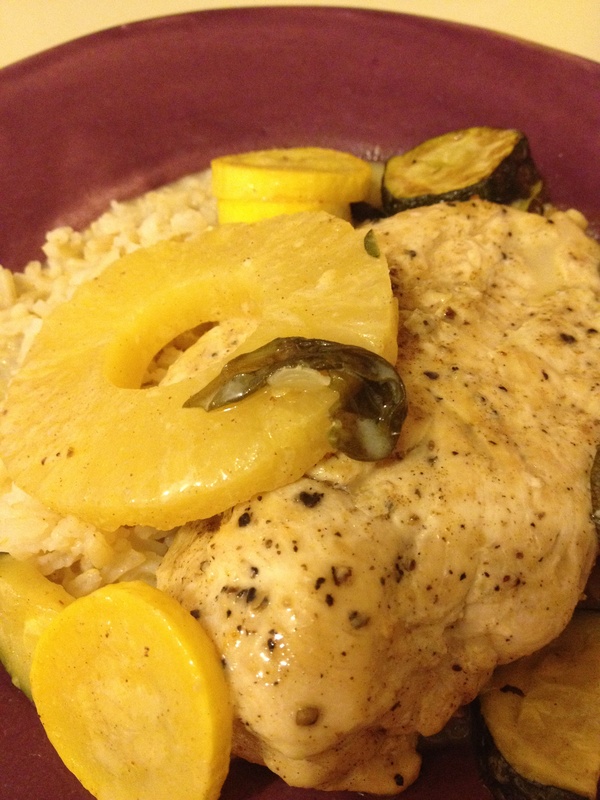 Serve hot over rice, being sure the plate the chicken, zucchini, squash, pineapple, and sauce. Always looking for lunch ideas, I decided to make a light version of chili using turkey, white beans, and nutrient rich vegetables. It is colorful, festive, and full of flavor. 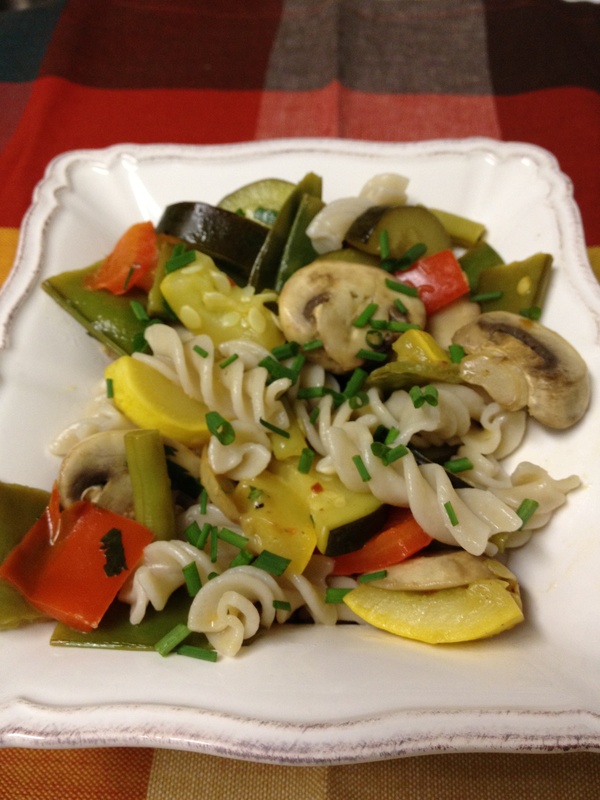 A great spring time twist on the hearty winter meal. It definitely spiced up my day! In a large deep saute pan, add the turkey, oil, cumin, paprika, onion, salt and pepper, and red pepper flakes. Stir constantly, mixing the flavors and breaking up the turkey into small chunks. 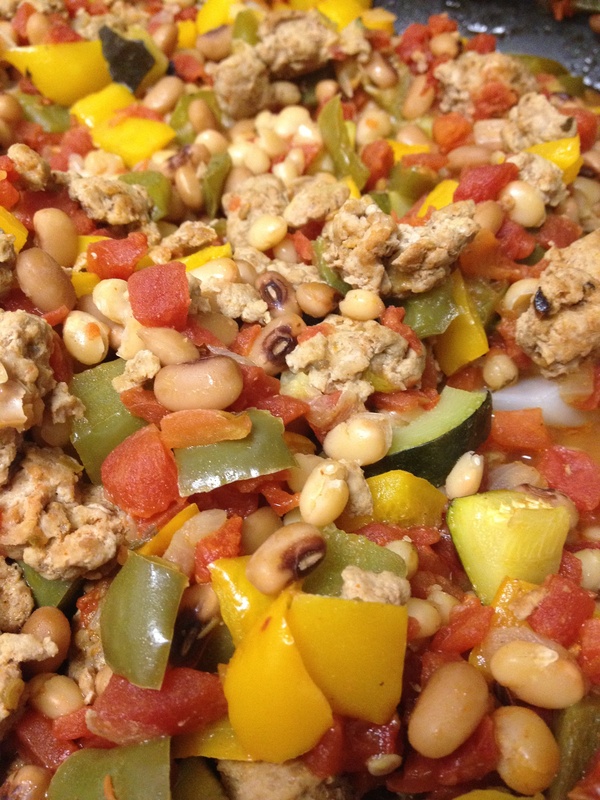 When the turkey is almost cooked through (about 5-7 minutes), add the chopped green peppers, yellow peppers, zucchini, diced tomatoes, white beans, and black eye peas. Cover and let simmer about 30 minutes on medium-low heat. Cook for the last 10 minutes uncovered. I came home tonight later than I thought I would, so I had to think fast when making dinner. I ended up using one cutting board, one knife, 2 baking pans, and only about 45 minutes! Out came Sweet Lemon Pepper Chicken and Italian Zucchini Rounds. Both added some great flavor to a busy evening. Drizzle honey over the chicken breasts. Pour lemon juice over chicken, then season with salt and pepper. Add more pepper if you like a kick! 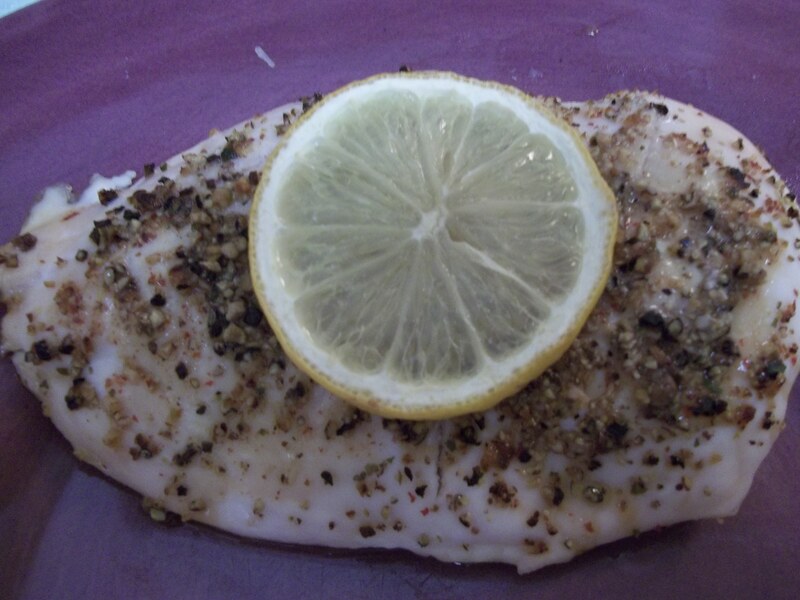 Place 2 lemon slices on top of chicken breasts and bake at 375 degrees for 30-35 minutes . 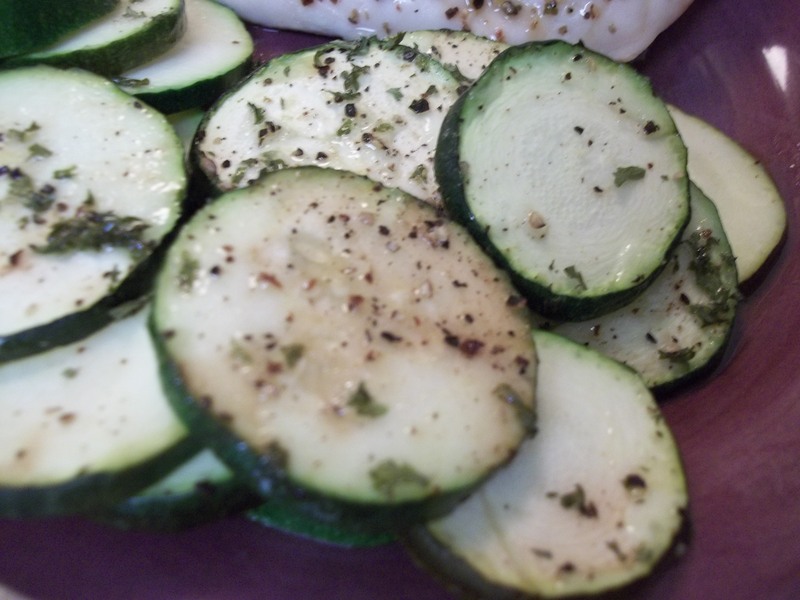 Toss zucchini with olive oil, red wine vinegar, parsley, garlic salt, sugar, and salt/pepper. On a baking sheet, bake at 375 degrees for 35 minutes.